Gravity PDF Previewer version 1.1 includes a few highly-requested feature from our users, as well as one bug fixe. The first new feature is the option to allow the end-user to download the Previewer PDF. This functionality is disabled by default and will need to be enabled in the Gravity Forms Editor. Another feature includes the full integration with Gravity Flow’s User Input step. 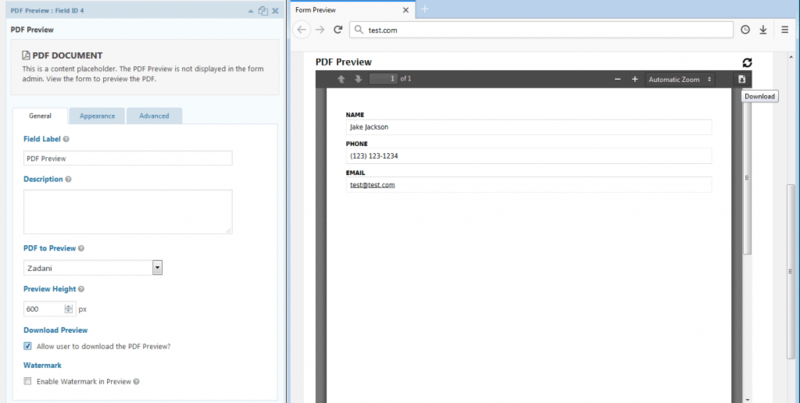 The Previewer field can now be included as a Display Field in the User Input step and the end-user will see what the generated PDF will look like live on-screen. This is an excellent feature if you’re using Gravity Flow to capture signature from multiple parties. User’s can preview the document they’re signing on screen, sign it, and then see what the document looks like with their signature included, all before submitting. Winning! The Gravity Flow User Input step with the Previewer field included. The GravityView Edit Entry step was tweaked to support uploaded files in the preview. While developers can check the DOING_PDF_PREVIEWER constant is true in custom PDF templates to conditional display information when the PDF is being previewed (see the docs for more details). Finally, a bug fix was included which prevents the Previewer fields showing up in Core / Universal templates when the Show Empty Fields option is enabled.